The stories of the Old Testament can sometimes seem messy, confusing, disheartening and discouraging. We wonder sometimes if God was different in Old Testament times. In truth, it’s crucial to understand the big picture of Israel’s history and their interaction with God so that we can better understand what part that plays in the gaining a better understanding of who God really is.. This is the story of a God who will try anything to convince His people to return to Him. It’s the story of God’s continued faithfulness to His covenant with Abraham and His ultimate covenant with all who believe. Why should we study the Old Testament? Isn’t that just ancient history? What do these stories teach us about what God calls us to do and who God is calling us to be? In order to gain a broader perspective of the character and ultimate plan of God we have to delve into the foundations: The Old Testament. Take some time to look up and read through the following scriptures. 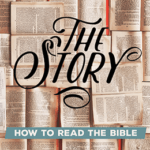 Use this opportunity to gain some insight into who the God of the Old Testament really is and why understanding the “whole story” is important.